Jumbo cookies: no doubt about it, they’ve got the “Wow” factor. But they’re easy to make! Just a few baking tips for jumbo cookies can help you save time, mess, and hassle when making these palm-sized, mega treats that are favorites at bake sales, in cookie baskets, at picnics, or when simply feeding a room full of hungry teenagers. Jumbo cookies are two to three times the size of regular drop cookies – often about 4 to 6 inches across. That’s more cookie dough per cookie. But how much? If you make cookies too big by dropping too much dough, they are difficult to bake through without getting crusty on the edges. 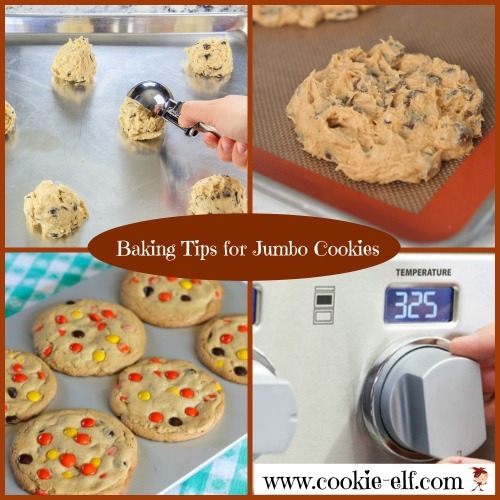 You can achieve a uniform size using these baking tips for jumbo cookies. Tip: Test! Always bake one or two cookies as a test batch first. You’ll discover how much the dough spreads so you’ll know how big to make them. Tip: Use a bigger measuring device than for drop cookies, such as a large ice cream scoop or a ¼ cup or 1/3 cup measure. Scoop the dough and use a kitchen knife to level the scoop surface. Then drop cookie dough onto the baking sheet. Tip: Make evenly-sized jumbo cookies by rolling cookie dough into 3-4 inch logs, as you would for refrigerator cookies. Wrap logs in plastic wrap and chill for 30 minutes or overnight. Then remove logs from the refrigerator, unwrap them, and slice them into even widths. I’m sure you agree: cookies that run together (either in the oven or after baking) may taste good, but look bad and make a mess. Tip: Bake fewer cookies per baking pan – about 6 jumbo cookies compared with 10 or 12 regular-sized drop cookies per pan. Allow 3 inches in between cookies so that dough doesn’t run together as they bake. Tip: Let baked cookies sit on the baking sheet for 3-5 minutes before using a spatula to move them to the wire rack to cool. This way they will maintain their shape. Baking time for giant cookies can be tricky, especially if you are using a favorite cookie recipe that was not created specifically for jumbos. Overbaked or under-baked: neither taste as good as you’d like. A jumbo cookie that is underdone breaks easily; it simply can’t hold together. An overbaked cookie is so crunchy along the sides that its edges break off. Tip: Use a silicone (silpat) mat or on parchment paper to line the baking sheet, rather than simply just greasing it, to help the cookie dough bake evenly. Tip: As the cookies bake – especially as you do your test batch – watch the edges and peaks. The cookies are done just as these start to get light brown. Want to use a favorite cookie recipe to make jumbo cookies? Keep in mind that jumbo cookie dough tends to be a bit heavier than its regular-sized counterpart. If you follow a recipe that’s not specifically structured for jumbo cookies, then there is a good chance that the cookie dough might spread a lot. That’s not to say that a regular cookie recipe won’t convert well. Many do either as is or with just a few modifications. Tip: Experiment. Mix together the ingredients of your selected recipe according to directions and then bake one or two jumbo-sized cookies at a time. If the jumbo cookie size spreads too much for your preference, then try one or more adjustments. Tip: Make an adjustment to prevent cookie dough spread by adding an extra ¼ - ½ cup flour to the dough. Tip: Make an adjustment to prevent cookie dough spread by adding an extra ¼ - ½ cup of add-ins, like nuts or raisins. Tip: Make an adjustment to prevent cookie dough spread by chilling the dough for an hour. Chilling allows the butter or margarine to solidify. That means once the cookies go in the oven, the butter takes a longer time to heat … the moisture in the butter takes a longer time to evaporate … and the cookies don’t spread as much. Tip: Make an adjustment to the oven temperature to prevent cookie dough spread. If your oven isn't hot enough, the cookies don't 'set' quick enough, and the cookies have more time to spread. But if the oven is too hot, then the edges of the cookies with bake faster than the middle. Try moving the temperature down 25 degrees from the original recipe and see if you can get a good balance between temperature and cookie size. See more baking cookies tips on our Baking Tips Pinterest board. How to keep marshmallows fresh after you've opened the bag ..